Curious to find out which of the new character-specific dice in Super Mario Party was the best, a maths teacher in the US decided to research their underlying statistics. While he found that some characters are better for rolling higher numbers on average, the game is overall too random for character choice to always matter. In the 20 years since Mario Party came out on the N64, the struggle for each new Mario Party has always been to distinguish itself just enough to warrant a new numeral without shedding too much of the mysterious magic that keeps a not insignificant number of lost souls coming back every couple years. Super Mario Party tries to accomplish this with a new system of custom dice rolls unique to each character. Previously, characters had equal odds of getting a random number between one and 10 every time they punched a block to start their turn. Now, they also each have access to a custom six-sided die with various mixes of advantages and disadvantages. For instance, Bowser, playable for the first time in Super Mario Party, has a custom dice block with two faces that dock him three coins instead of moving him. Another face has a value of one, and the three remaining sides have values of 8, 9, and 10 respectively. He’s risky, in other words, but he has a 50-50 chance of rolling an 8 or higher. Austin Wayne, who teaches algebra as well as English, took to the Switch subreddit to post a table showing all of the dice roll possibilities for each character in the game and the resulting mean, variance, and standard deviations. While the means (averages) for most characters are between three and four, there are a couple of notable outliers like Bowser, whose average is 4.67, and Hammer Bro, whose average is 2.83. What this means is that someone playing as Bowser using the King Koopa’s custom die is likely to move 1.6x as many spaces during a match as someone using Hammer Bro’s. 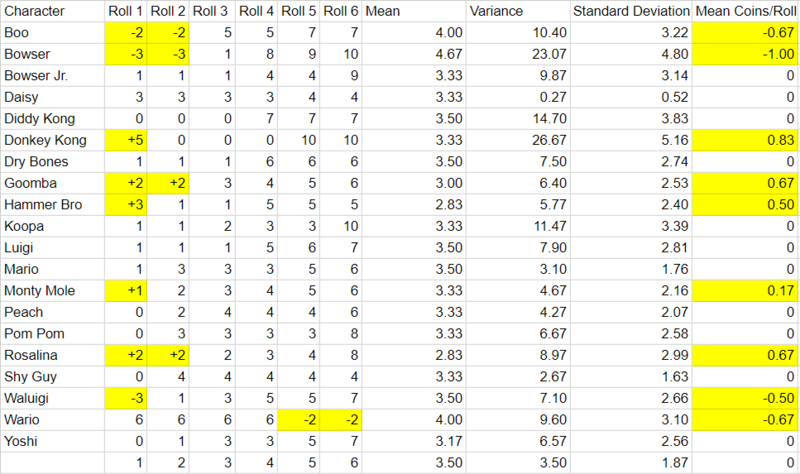 The more interesting takeaway has to do with the variance, or how dramatically characters’ individual dice rolls differ from their average. Donkey Kong, for instance, though his average die roll is in the centre of the pack, has a variance of 26.67. That’s a reflection of the fact that while he’s averaging 3.33 spaces per turn over the course of a game, his actual turn-by-turn rolls fluctuate between 0 and 10. He’s either not moving at all or moving a tonne. “I was surprised that there was so much variation character to character, and such a large swing between fan favourites (eg. Yoshi having an average of 3.17 and Bowser having an average of 4.67),” Wayne said in an email to Kotaku. He doesn’t think that means people should only be picking Bowser, though. If you’re only a few spaces away from buying that all-important star before it moves, a more reliable roll will help out more than an unpredictable one with a better overall average. 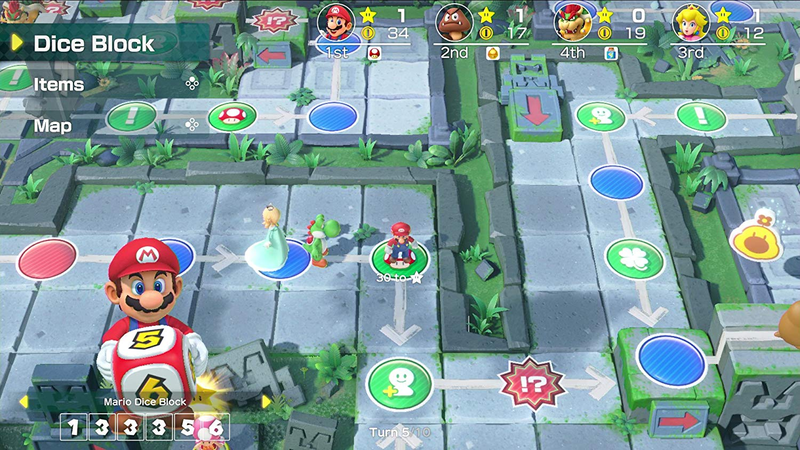 While it’s not enough to transform Mario Party into a game of sheer skill, it does add a nice layer of light strategising that lets people approach the game differently. Of course, as I said in Kotaku’s VG chat about the game earlier today, I’d like to see the series adopt even more RPG mechanics and go full-blown D&D, but for now unique dice will have to suffice.